The first time I saw Michael Schumacher was at the 2003 US F1GP at the Indianapolis Speedway. During one of the qualifying sessions his Ferrari broke down near me and was able to get some shots of Schumacher out of the car. 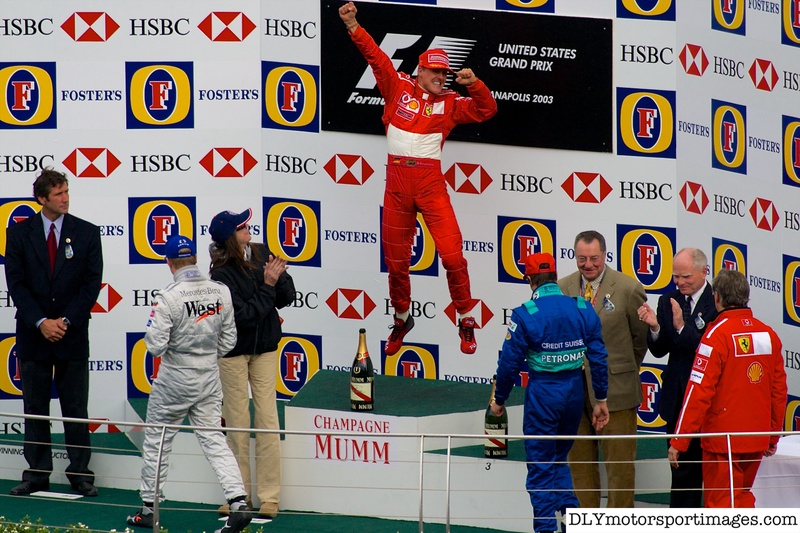 Schumacher won the race, and I always enjoyed the jubilation he showed on the podium and the characteristic “victory jump”. Earlier this year I saw Schumacher at the Nurburgring, when he did a demonstration lap of the Mercedes AMGW02 F1 car, and did a photo story about this (https://dlymotorsportimages.com/2013/06/03/retrospective-schumacher-dslrs-then-and-now). My thoughts and prayers to Michael Schumacher and his family, and wish Schumacher a speedy recovery. Please get well soon, Michael!